The 2011 Girls Generation Tour DVD and Photobook is now available for pre order. It is be available for physical pick up on November 30th. But for now, pre order your copy here! Go for it and enjoy all the great moments from 2011! Check out the quick promotional video for the DVD/Blu Ray release of “I AM.” Only a little bit of SNSD as maknae Seohyun says a few words with her cute Korean accent in English :D.
[UPDATED] The 1st Asia Tour: Into the New World DVD Finally Releases! You’ve read it right! It’s another moment we’ve all been waiting for! Next month (~August 19th), the DVD of their first Asia tour, “Into The New World“, will be released. Aside from the 2-Disc DVD, The 1st Asia Tour: Into the New World DVD set will include an 80-page concert photobook and a poster as well. If you remember, the girls kicked off their very first Asia tour in Seoul in December of 2009 at Seoul’s Olympic Park Fencing Stadium. Initially, they were to hold only 2 concerts in Seoul on the 19th and 20th, but due to success of their first one, they held 2 encore concerts in Seoul on February 27th and 28th. They then continued their tour overseas in countries including China, Thailand, Taiwan, and Japan. Today saw the release of the All About Girls’ Generation ‘Paradise in Phuket’ DVD, and SONEs who were fortunate enough to have obtained a copy, are probably isolating themselves from the rest of the world for the next 12 or so hours. + Added Soshi Subs edits after the jump! Only a couple more sleeps until the DVD is released on June 30th! + Added more details & link to preorder on YesAsia! 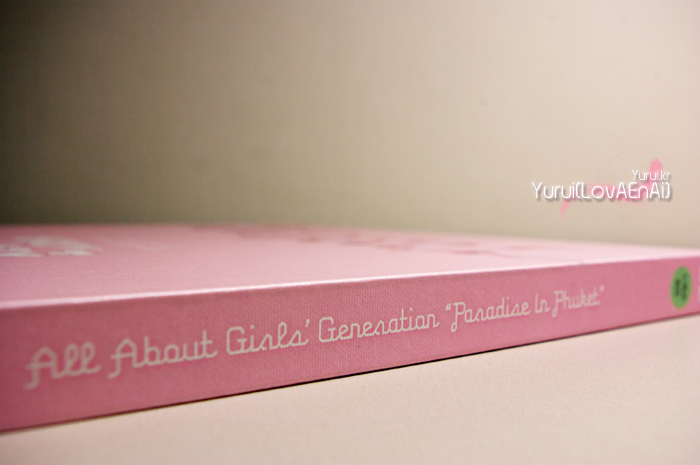 If you recalled, in February of this year, the “All About Girls’ Generation ‘Paradise in Phuket'” DVD preview was released to the public and it was in the form of a photobook. Coming the end of June (June 30th~July 5th), the actual “All About Girls’ Generation ‘Paradise in Phuket'” DVD will finally be released. All SNSD M/V, 「Hoot」individual member ver. M/V, Making films, 「Echo」M/V, Phuket Variety Show「Real Treasure」, Interviews, Self-cameras, SBS「Popular Song(Inkigayo)」, 「Kim Jeong-eun’s Chocolate」, Etc. Preview Of SM Town LA 2010 Concert DVD/Blu-Ray Disc? On Youtube, the girls’ performance of ‘Oh!’ at last year’s ‘SM TOWN ’10 LIVE in LA‘ ripped from Samsung’s blu-ray Demo Disc has surfaced. EDIT: Sorry for the confusion but this preview is just TEXT AND PHOTOS. NO DVD. The actual DVD to be released in the future is RUMORED to be 16 hours long! SNSD is set to release an All About Girls’ Generation “Paradise in Phuket” DVD Preview photobook on the 8th of February, with an accompanying DVD.